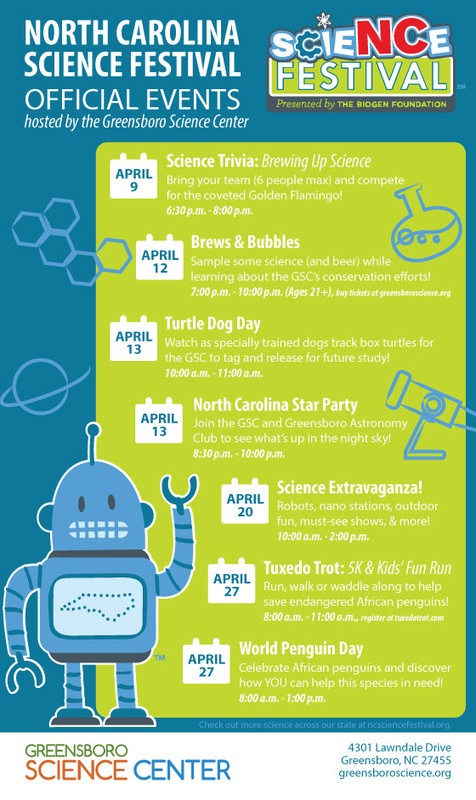 The Greensboro Science Center (GSC) is proud to participate in the North Carolina Science Festival throughout the month of April by hosting seven on-site events designed to inspire scientific curiosity. The North Carolina Science Festival is a month-long celebration of science that brings hundreds of events focused on fun, interactive science learning opportunities to communities throughout North Carolina. Beer is made from four basic ingredients: a grain (usually barley but sometimes wheat or rye), water, hops, and yeast. The basic idea is to extract the sugars from the grains so that the yeast can become alcohol and carbon dioxide, leading to beer. First, the grains are harvested and processed by heating, drying out and cracking – a step called malting. The main goal of malting is to isolate the enzymes needed for brewing. An enzyme is a protein molecule in cells that works as a catalyst to speed up chemical reactions. Next, the grains go through a process known as mashing. The processed grains are steeped in hot water for about an hour (similar to making tea… but it’s beer tea). This activates the enzymes in the grains, causing them to break down and release sugars. Once this is all done, the water is drained from the mash, which is now full of sugar from the grains. This sticky, sweet liquid is called wort. It’s basically unmade beer, sort of like how dough is unmade bread. The wort is boiled for about an hour while hops and other spices are added several times to create different brews. Hops are a vine plant’s small, green cone-like fruits. They provide bitterness to balance out all the sugar in the wort. They also provide flavor and act as a natural preservative, which is what they were first used for. The cooled, strained and filtered wort is then put into a fermenting vessel to which yeast is added. At this point, the brewing is complete and fermentation begins. During this time, the beer is stored for a couple of weeks at room temperature (in the case of ales) or several weeks at cold temperatures (in the case of lagers), while the yeast eats up all the sugar in the wort and spits out carbon dioxide and alcohol waste products. Yum! At this point, alcoholic beer is born. However, it’s still in a flat and uncarbonated state. This flat beer is bottled and can either be artificially carbonated like a soda, or if it’s going to be ‘bottle conditioned’, allowed to naturally carbonate via the carbon dioxide the yeast produces. After allowing the beer to age for anywhere from a few weeks to a few months, you can drink the beer – and it’s delicious! GREENSBORO, NC — On Wednesday, June 27, the Greensboro Science Center (GSC) is bringing back an old favorite with a new twist. The GSC’s popular maze will return as the Color Maze, a puzzling adventure that highlights the science of light and color. GSC members will receive a preview of the exhibit from 9:00 a.m. – noon on Wednesday, June 27 before it opens to all GSC guests at noon. Upon entering the exhibit, guests will encounter hands-on stations designed to shed some light on everything from optical illusions and color blindness to ultraviolet light and wavelengths. Young children are invited to explore and learn in a play area containing manipulatives like colorful blocks and books about colors. In addition, guests can pop virtual balloons and watch them rain colorful confetti, create colored shadows, and put on a puppet show with shadow puppets. The maze itself features twists and turns with colorful surprises around every bend. Fireflies are featured in an area designed to enlighten guests about bioluminescence (light produced by living things). Prisms illuminate the mystery behind rainbows, demonstrating how white light is split into the color spectrum. Shooting stars spotlight the science behind the different colors you see when meteors streak through the sky. Fun finds like colorful orbs and a black light zone also await discovery. Admission to the Color Maze is included with general admission to the Greensboro Science Center. General admission is $13.50 for adults ages 14 – 64, $12.50 for children ages 3 – 13 and $12.50 for seniors ages 65+. Children 2 and under as well as Greensboro Science Center Members are free. About the Greensboro Science Center – A premier family attraction in North Carolina that offers the state’s first accredited inland aquarium, a hands-on science museum, an accredited Animal Discovery Zoological Park, a state-of-the-art OmniSphere Theater, and SKYWILD, an animal-inspired treetop adventure park. The GSC is also NC’s only dually accredited AZA (Association of Zoos and Aquariums) and AAM (American Alliance of Museums) science attraction – an honor only 14 attractions in the nation can claim. The Greensboro Science Center is located at 4301 Lawndale Drive in Greensboro and is a 501 (c) 3 non-profit organization. For more information, visit http://www.greensboroscience.org. GREENSBORO, NC – The Greensboro Science Center (GSC) will host Amy Stewart, the author of “Wicked Plants: The Weed that Killed Lincoln’s Mother & Other Botanical Atrocities,” at a Science Café on Wednesday, April 4 from 6:00 p.m. – 7:30 p.m. Stewart’s book is the basis of Wicked Plants: The Exhibit, hosted at the GSC through May 6, 2018. Admission to the Science Café is free. Join author Amy Stewart for a closer look at the medicinal, mind-altering and mysterious properties of plants, from strangling vines to heart-stopping seeds and even a leaf that started a war! Amy blends science with history in this talk, a companion piece to Wicked Plants: The Exhibit. Wickedly tasty snacks will be provided before the talk. Stewart will also be signing copies of her book, “Wicked Plants,” available for sale at the event. Her talk is geared towards older children and adults. This event is part of the North Carolina Science Festival, a month-long event that highlights the educational, cultural and financial impact of science in the state. Best-selling New York Times author Amy Stewart is no stranger to the perils and pleasures of the natural world. To date, she has written nine books, including “The Drunken Botanist,” “Wicked Bugs” and “Flower Confidential.” Beyond putting pen to paper, Amy travels the country as a highly sought-after public speaker whose spirited lectures have inspired and entertained audiences at college campuses, corporate offices, museums, gardens and libraries nationwide. She currently resides in Portland, Oregon, with her husband Scott with whom she owns an independent bookstore (so independent that it lives in California) called Eureka Books. Amy’s books have been translated into 16 languages and her 2009 book, “Wicked Plants: The Weed that Killed Lincoln’s Mother & Other Botanical Atrocities,” has been adapted into a national traveling exhibit entitled Wicked Plants: The Exhibit. She has been awarded a National Endowment for the Arts fellowship, the American Horticulture Society’s Book Award and an International Association of Culinary Professionals Food Writing Award. For more information on Amy, please visit amystewart.com. Looking for the perfect gift idea that’s fun for the whole family? How about a full year of free Greensboro Science Center admission?!?! A GSC membership offers just that – and much more. For as little as $32.40 per person (including tax), a membership truly is a gift that keeps on giving. Not only will it give your loved ones a full year of exciting, memorable, and educational visits to the GSC, they’ll also receive lots of discounts — including discounted admission for their guests, discounted OmniSphere Theater and SKYWILD tickets, discounts in the gift shop and cafe, and discounts on birthday parties, classes and camps! Members will enjoy exclusive invitations and previews of new exhibits and OmniSphere shows. They’ll also receive information about how to get involved in citizen science programs, be the first to learn about upcoming GSC projects, and get exclusive peeks at what happens behind the scenes of the GSC in our member-only e-newsletters. If your loved ones enjoy traveling, the savings will go even further! GSC members receive free or discounted admission to over 300 Association of Science-Technology Centers and over 150 Association of Zoos and Aquarium facilities, giving your loved ones the chance to explore amazing science centers, zoos and aquariums all around the country (and world!) for a fraction of the cost. Click here to see the complete list of member benefits and to purchase a gift membership online. If you’re a boss looking for a great gift for your employees (or an employee looking to encourage your boss to give you an awesome, experiential gift! ), you’ll want to check out our Business Membership program. Business memberships include GSC membership cards in the company’s name for employees to use. During their visit, employees using the business membership will also receive discounts in the gift shop and cafe. It’s a great way to show your employees your appreciation while supporting science education! Click here to view business membership levels and to download a business membership order form. Whether you’re looking for a gift for a family or for your employees, the GSC has a membership program that’s right for you!